April 19. Up, once again, at 5:30, breakfast and set off again on our morning safari, on this, our final full day in Botswana. This is the second consecutive morning on which wearing a light jacket for the first couple hours is welcome because of the morning chill. Our target, cheetahs, eludes us once again. 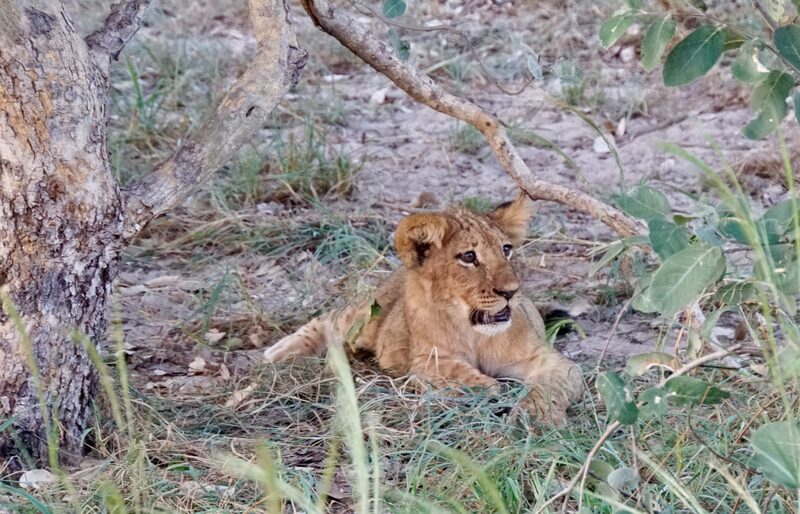 After much searching, though, we do find the two lionesses we spotted yesterday, who are hidden in bushes with their four cubs, with two former impalas that they’ve killed. Their position in the bushes, together with three other vehicles who have learned via radio of our location makes photography pretty impossible. So, a very good sighting, but not one of our best of the trip. After driving around for a couple more hours, with good, but not extraordinary sightings, G tells us that we’re going to have lunch out in the bush. 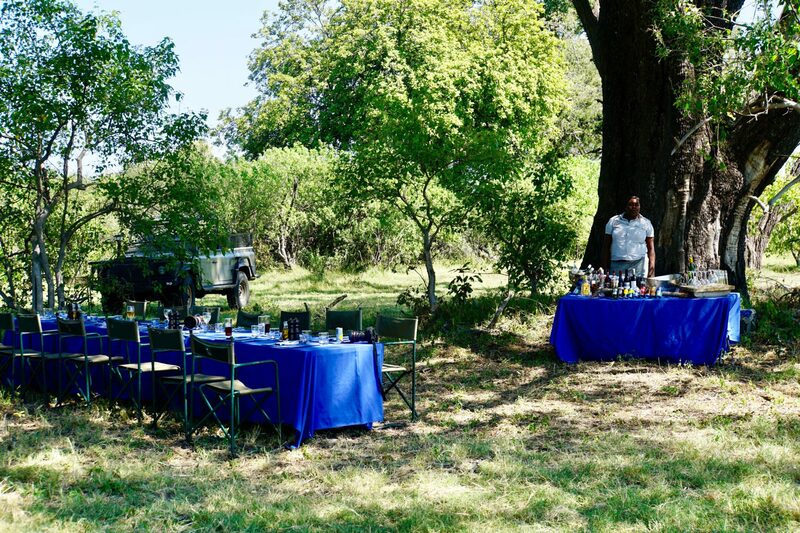 I picture a box lunch under a tree, but, in fact, a very nice buffet and bar have been set up for us and another group of eight who are on a photography trip. We have a pleasant travel-related conversation with Karen and Stev(e) from California, who love the trip we’re doing with Phoebe. Stev has done a lot of travel with his kids, including bike and horseback adventures. After lunch, we enjoy our siesta time before regrouping at 3:30 for our last game drive, with G sporting his new Cubs hat. 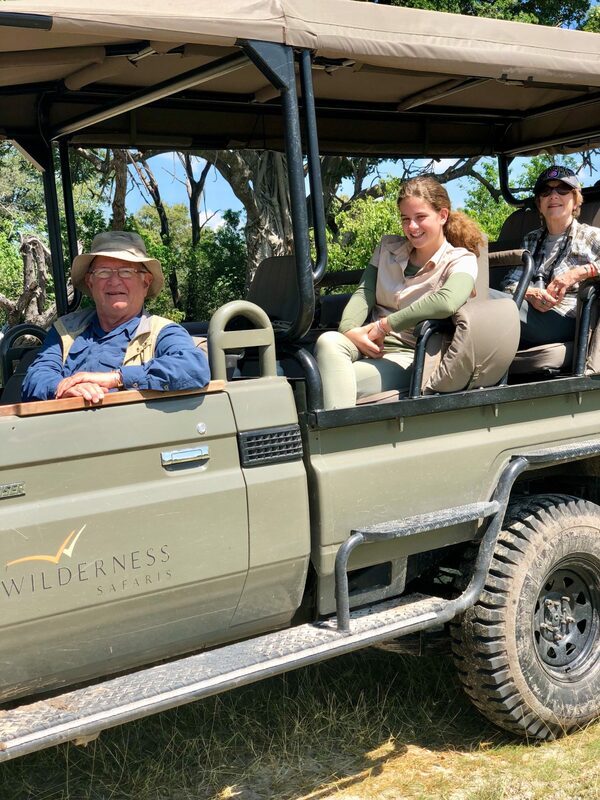 Several sightings, including a new bird for Phoebe’s list and a new antelope, but things really got to be fun when I suggested we go back to check on the lion cubs who has been hidden in the bushes in the morning. First, we see the two lionesses lying asleep by themselves, then we locate and watch the cubs for whom it is clearly play time. After some time, we notice the the lionesses are making their way back to the cubs, who greet their moms with great excitement and affection. We head back to the camp, where Phoebe and I have drinks by the fire with the managers under the stars, while Carol goes back to shower. Dinner is very good, again, and we engage in conversation with a California couple, more in sync with the wife, Julie, than her highly opinionated husband, Richard, with whom I disagree strongly on topics of conversation ranging from photography to civil liberties. He says that I’m more of a humanitarian like his wife, contrasting that with his passion for hunting (yet strong interest in birding). He’s bright, and, given half a chance, I could get into a lot of heated arguments with him, I’m sure. That cub in the tree is a real treasure! So thrilled for all of you! 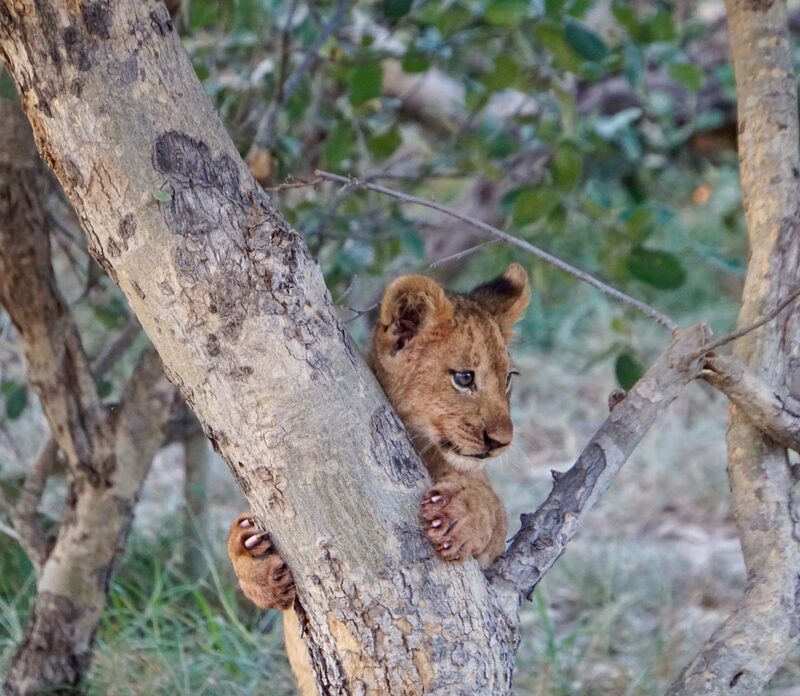 That lion cub in the tree is my new screensaver! Adorable.